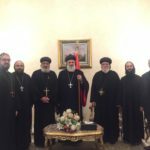 On January 31, 2019, His Holiness Patriarch Mor Ignatius Aphrem II concluded his visit to Egypt. His Holiness Pope Tawadros II, Pope of Alexandria and Patriarch of the See of St. Mark for the Coptic Orthodox Church, delegated their Eminences Archbishops: Anba Klemandos, Assistant Bishop for the Patriarchal Suffragan Holy Diocese of El-Hagana & Almaza in the Holy Archdiocese of Cairo, and Anba Michael, Assistant Bishop of the Patriarchal Suffragan Holy Diocese of Hadayek El-Kobba, El-Wailly & Mansheyat El-Sadr in the Holy Archdiocese of Cairo and assistant to the Pope, and Dr. Gerges Saleh, the ecumenical representative of the Coptic Orthodox Church, to farewell His Holiness Mor Ignatius Aphrem II at the Ciro International Airport. Very Rev. Raban Philippos Issa, Parish Priest of St. Mary Church in Cairo, was also present. His Holiness was accompanied by His Eminence Mor Timotheos Matta Al-Khoury, Patriarchal Vicar in the Patriarchal Archdiocese of Damascus and in Egypt, and Very Rev. Raban Joseph Bali, Patriarchal Secretary and Media Office Director.